The Warhorse of Esdragon trilogy, and other magazines/anthologies containing my stories. 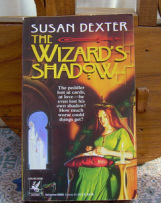 No one at Del Rey ever asked me what I was going to do next--I sent in a proposal for The Wizard’s Shadow, heard nothing, wrote the book, sent it in, heard nothing till 1992, when Veronica Chapman looked me up at the World Fantasy Convention. I told her about my plans to write the Warhorse of Esdragon books, and also about the earlier book. I eventually saw a letter that Lester Del Rey wrote regarding changes he wanted on the book, but he never did a contract or even mailed the letter. I’m not sure Del Rey would have bought Shadow at all if they hadn’t thought there already was a contract for it--but joke’s on them, that’s the book that got named to the New York Public Library’s Books for the Teen Age list! I then wrote The Prince of Ill Luck, TheWind-Witch, and The True Knight, which appeared from Del Rey Books with very nice covers. Then I wrote The Wandering Duke, but though Veronica Chapman wanted to buy it, Del Rey was changing direction and didn’t wish to continue the series. Word was that didn’t rule out other books, but they didn’t choose to go with any of the other proposals. There was some advice about writing books set in another invented world, but that didn’t ultimately make any difference. I rewrote my novella Thistledown as a YA, and it was shopped around a lot with no results--too young, too old, too well-written, time not right for fantasy, wanted fantasy set in modern world--the whole runaround. 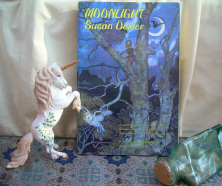 I wrote Moonlight on spec for Hyperion, but they decided the time wasn’t right for them to do a hardcover fantasy. And I got a ton of career advice about what I should write and what age I should write for, but none of it ever meant a sale. And life went on. There’s no art without obsession. I was inspired originally by Tolkien, but not to write about elves and ents. I wanted to craft my own world, and explore it. I did that, book after book, keeping it consistent, making it deeper and richer as I went. And I started to wish that I’d done more with the books I wrote first in the world of Calandra. When I saw the Harry Potter and Lord of the Rings movies, I remembered why I loved fantasy--and I missed my wizard more and more. I’ve spent several happy years with Tristan. He's never far from me. I’m pleased with what I’ve done with these books. They’ve been rewritten from one end to the other, with no sentence ignored or unquestioned. There are things in Wizard's Destiny now that I didn’t know the first time around, because they cropped up in other books as I wrote them. The whole series is now something of an Ourouboros, cause and effect coming full circle. It’s been worth the doing. Obsession's not always a bad thing!